HALEY: Do you have a favorite ballpark and why? JUSTIN: My favorite place to play is probably Camden Yards. I came up there and the Baltimore Orioles were my first big league team so it was my home field. It is just beautiful park and the warehouse in left field is incredible. HALEY: Who has the best Hot Dogs? Cincinnati Kahn’s Hot Dogs, Baltimore Esskay Hot Dog or New York Nathan’s Hot Dogs? JUSTIN: I actually got to try a Nathan’s hot dog last year and it was pretty good. It lived up to the hype so I am going to have to go with Nathan’s. JUSTIN: In New York it would have to be STK Steakhouse, I got to meet one of the general managers there and he takes good care of me so I go in and get a big fat steak. They also have these really good cheeseburger sliders. HALEY: And in Southern California? JUSTIN: When I am back home, I grew up going to a little Mexican Restaurant called Mi Casa and every Friday night my mom, and my dad and sister would go in there and have some extended family come in so its kind of a little tradition we have so it probably my favorite place to eat. HALEY: What was it like growing up in California? JUSTIN: Sunny! Always had good weather. So the best thing was getting to be outside and playing with my friends year round. We used to ride are bikes everywhere, playing wiffelball, football, baseball, pretty active, I was always outside. HALEY: Who is the biggest practical joker you have ever been on a team with? JUSTIN: That’s a tough one. I’ve had some good ones. I had a pitching coach with Cincinnati Reds named Teddy Power he was pretty good. Fellow Met, Tim Byrdak as well, I wouldn’t call him a practical joker but he is full of little things that make everyone laugh. HALEY: Have you ever been the victim of one of his practical jokes? JUSTIN: Yeah I have been couple of times. Guys putting bubble gum around the top of a cup of water and sticking it to the roof of the dug out right above my head and after about 15 seconds it falls down on top of my head. HALEY: Have you gotten them back? JUSTIN: Laughing, yeah I got him back, but I am not going to bring up how but I definitely got them back. JUSTIN: Ah, I am sports fanatic I kinda like everything. I wouldn’t call it a favorite, but I love going to Hockey games during the off-season and basketball, I’m a Lakers fan, and football. I like the Dolphins; the last couple of years I have made a trip down to Miami to watch them. HALEY: Do you have any rituals or superstitions before and during a game? HALEY: Other than winning the 2004 College World Series what other accomplishments are you proud of? JUSTIN: Playing in the major leagues. That’s something that I’ve always dreamed of. In 2009 when the Orioles called me up and I got to play my first game at Fenway Park. 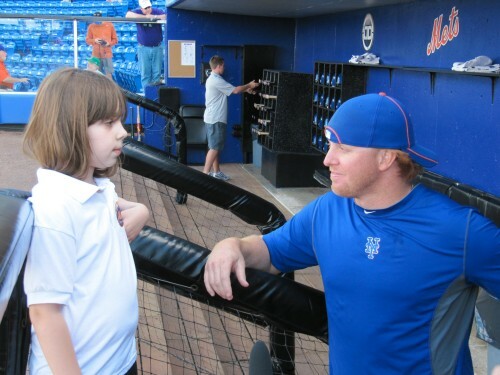 HALEY: Last year you played all over the infield, what is your role with the Mets so far this season. JUSTIN: That’s hard to say right now. We have a couple of guys that are a little banged up right now and if they are healthy then I’ll probably end up being a role guy. I added a first baseman’s glove to my collection, last year so hopefully I’ll get to play first base again this year, but wherever Terry (Collins) needs me to do, whatever it is, I’ll go out there and do my best. HALEY: How many sets of uniforms do the Mets organization gives you? And do you wash them yourself? JUSTIN: Uh let’s see. Last year we had our pin stripes, our white home jerseys, our grey uniforms, our black uniforms, and then the blue Los Mets, so that makes five. NO, I don’t wash them they do that for us, so I try to get them as dirty as possible since I don’t have to wash it myself (laughs). HALEY: What types of community service or charity work are you involved in? JUSTIN: Throughout the season, we go out and do lots of stuff. We go to schools and fire departments that the Mets set up for us. During the off season, I have a couple of little cousins that play little league and I go out and help them and work out with the kids up there. I really have fun with them and really enjoy it. I think they really like it too. HALEY: If you were not playing baseball, what else could you see yourself doing? JUSTIN: I don’t know. I think the only other thing I’m decent at is tweeting, so hopefully by the time I am done playing they’ll have a professional tweeting job. HALEY: I read you played winter ball in the Dominican Republic in 2010 what was that like? JUSTIN: I loved it down there, I got called down by Ken Oberkfell who was the Mets bench coach in 2011 and he was the manager and he asked me to come play with him and I had an absolute blast. HALEY: Who did you play with down in the Dominican Republic? JUSTIN: I played with guys like Andy Dirks from the Tigers, Wilkin Castillo from the Dodgers,Marcos Mateo from the Cubs, Peter Bourjos from the Angels, there was all types of guys down there. HALEY: Somewhere I read you said that your father was your greatest influence. What baseball players or coaches do you think most influenced you? JUSTIN: Two of the biggest influences other then my dad were my college coaches. Coach George Horton he was the head coach at Cal State Fullerton. I played under him for all four years and he basically taught me everything I could possibly know about the game of baseball and was super detailed about everything. The other was his assistant coach Rick Vanderhook who is now the coach for Fullerton. He is actually like an uncle to me I grew up with him and is one of my dad’s best friends. He gave me the opportunity as a kid to hang around Fullerton and be a batboy for the team. I was constantly around baseball. I have to give them a lot of credit. HALEY: When you were in the minors, who were some of your different roommates? JUSTIN: My favorite roommate in all minor league baseball was a kid named Tony Esquer. HALEY: Where is he now? JUSTIN: He is back at home he is done playing, but I have never met or been around someone who could make me laugh so hard. He was always joking around, pulling little jokes. We would be trying to go to sleep and he would be sneaking around messing with me trying to make me think there was a ghost in the room or something like that. He was one of the funniest guys I have ever roomed with. HALEY: I have heard you are active on twitter, do you think it is a good way to interact with your fans? JUSTIN: Absolutely, I love being on twitter. I have over 34,000 followers now most of them are all New York fans. I get asked all kinds of questions every day and it is a great opportunity to interact with them. 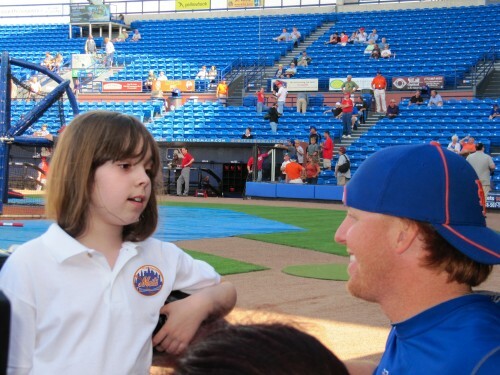 It gives fans/followers a little more insight about what’s going on over here with the Mets and me. HALEY: What is your twitter name? HALEY: How did you decide on that name? JUSTIN: Red because of my hair, turn because my last name is Turner so I shorted it and 2 because I play second base and turn double plays, also because I wear #2. HALEY: What did you do this year during the off-season? JUSTIN: I just relaxed and took some vacations. Mostly I relaxed and worked out to stay in shape for the new season. HALEY: What advice would you give to young players? JUSTIN: Don’t let anyone tell you, you can’t do it. I was never the biggest, tallest, strongest or fastest guy but I always worked hard. I always appreciated and loved the game. Everyone always told me I wasn’t going to make it but if you believe in yourself, keep working and practicing you can make it. HALEY: Please tell all your fans how you want to be remembered? JUSTIN: I don’t know I just like to have fun and enjoy the game. I play hard and respect the game. So hopefully I can maintain that and have a long career and hopefully I am known as a class act. 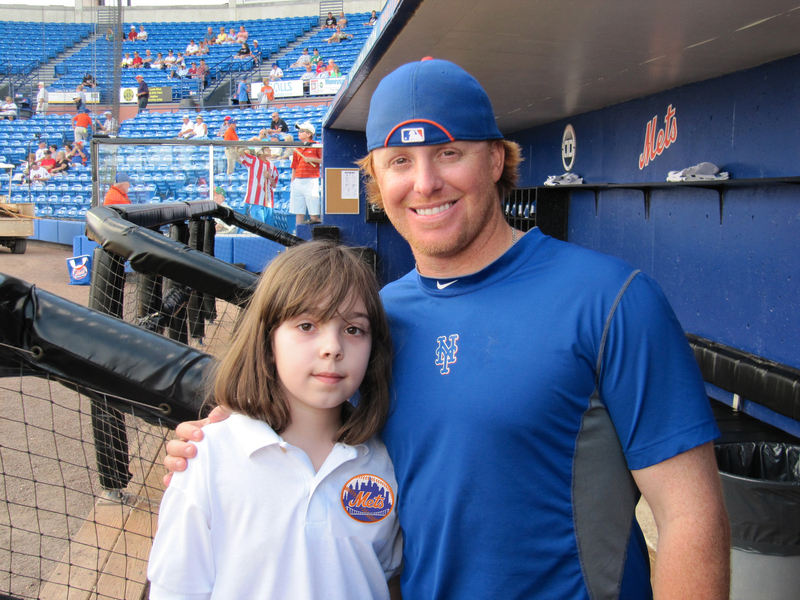 After the 2013 season, Turner was non-tendered by the Mets, making him a free agent. What ever team ends up signing Justin they have picked up a really nice guy and a good utility infielder.